YOU’VE heard other marketers talk about automation, right? They all say it helps them effectively market through different channels, and can help optimize their sales funnels. But, what is marketing automation? And is it something YOU need? With all of these opinions swirling around it can be hard to get straight answers. And even harder to assess how something like automation could help your own marketing efforts. Like, can it really help increase revenue? Or, is it something you can easily implement? Not to worry. In this post, we’re discussing automation and how it can help your business grow, so we’ll sort this out all today! Automation is really marketing transformed by technology. When people talk about automation, they often use the phrase “automatic marketing.” But it’s better to think of automation as a tool since the term refers to a series of processes that help you effectively lead customers down your sales funnel. Think of it like this. You set an alarm clock for a specific time, and when it reaches that time, the alarm goes off. You have to set the clock correctly, set the alarm time, be sure it’s on AM or PM accordingly, etc. But once it is set – you’re good to go. Your alarm will go off at the set time, every day. Automation is along those same lines, only thanks to technology – you’re using marketing software instead of a clock and choosing an action instead of a time. Plus, the alarm isn’t just an annoying buzz. Instead it’s a marketing email, a social media post or something else designed to drive your business forward! Automation, much like a clock, can help ensure you’re sending timely emails and having your sales team reach out at precisely the right moment. Which is key since timing can make-or-break a sale. Knowing when to jump in and interact directly with a potential customer may help your business generate more revenue. Meaning, if your marketing automation is set up correctly you’ll have a sales funnel that works for you. For example, when a customer enters their email address showing interest in a product, they’ll receive automated messages that ultimately lead them to make a purchase. Or, if a prospective lead performs specific actions, such as clicking through in a particular email, it can indicate that it’s time for a salesperson to give them a call. Done right, marketing automation will result in more sales. But be careful– in the marketing space, automation has become a buzzword. Many people jump on the bandwagon quickly and, unfortunately, start to integrate automation without knowing how to do it right. It’s important to start off on the right foot with a strong strategy and clear plan if you decide to implement automation. With planning and preparation, marketing automation nurtures prospective customers who are interested in what you have to offer. Targeting your efforts at the right people with an effective, well thought out program takes a lot of work up front, but will ultimately bring you results that are worthwhile. TIP: Automation has quickly become synonymous with email marketing, and many companies have begun buying email lists in an attempt to capture leads. We’ve said this before but buying an email list is a spammy tactic! Stick to credible methods for building your list. Ultimately, shortcuts are never going to result in the ROI you desire. The next step to set up a marketing automation program for your business? Look for holes in your existing program. Once you’ve determined where the holes are, you need know exactly how to fill them. What is it that allows you to send an automated email or set up a retargeting campaign? The answer is robust software. Email service providers, like Sendlane offer basic automation tools. Whereas comprehensive marketing automation platforms like Marketo, Salesforce, and HubSpot, allow you to set up marketing automation programs for your company. These companies offer great support, so they can help you figure out how to implement a process that works for you. Implementation can be trial and error, and requires consistent testing to ensure your efforts are working. Once your marketing automation system is in place, you’ll begin to see results. Many types of business use marketing automation to take their campaigns to the next level. Here are some common uses of marketing automation to inspire you. For example, when you fill up your shopping cart at Gear to Go, an online retailer for rental camping equipment, but neglect to check out, you receive an email the next day reminding you what’s in your cart. This email is part of Gear to Go’s marketing automation program, and reminds prospective customers to make a purchase. Follow up can be key to swaying customers who were on the fence. So with automated emails put in place – you can make those sales and generate more revenue. Any good business owner wants to have a pulse on what customers think of them. Many companies get feedback once or twice a year, when they send out a survey. But what if your feedback efforts could be automated? 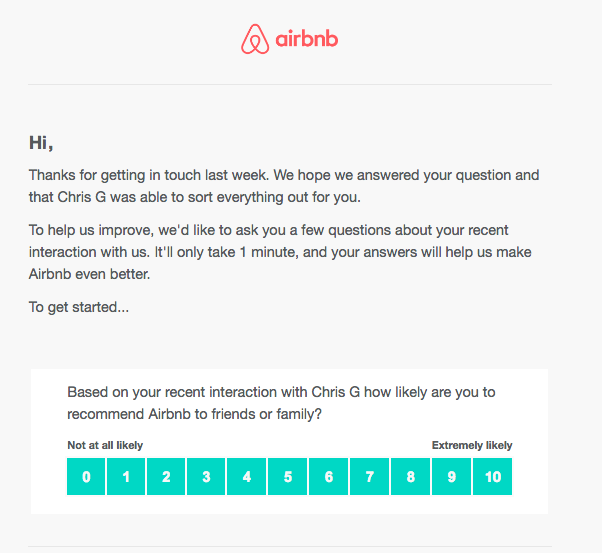 Airbnb sends out feedback requests via email based on a customer’s actions. If a customer contacts their support team, they’ll receive an email one week later asking about how the interaction went. 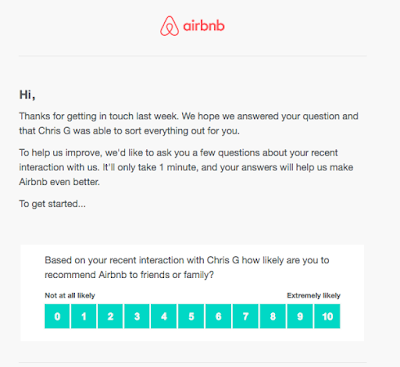 This type of marketing automation allows Airbnb to improve their customer experience, which will in turn generate positive reviews and more revenue for the company. Plus, when customers know they have the ability to share their opinion, they generally feel more valued by a company. Asking for feedback may just keep them coming back! One of the best ways to cultivate leads is to target the right people, and ad retargeting is helping businesses everywhere. If someone visits your website, you can set up a retargeting program that shows ads on their social media platforms. 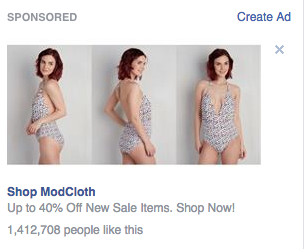 For example, if someone browses ModCloth’s website, they’ll be retargeted with ads on Facebook. There isn’t a marketer at ModCloth who manually sets up this process– the process is automated, and results in better marketing for the retailer, which ultimately leads to more sales. In order to remain competitive in today’s environment, it’s essential that you find ways to leverage automation in your marketing. Marketing automation can help improve lead quality and nurture leads down the funnel, which will ultimately boost your business revenue. 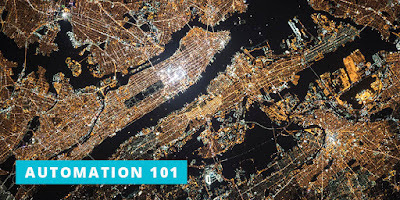 Are you struggling to get a marketing automation program off the ground? Sound off in the comments about what challenges you’re facing, as well as the successes you’ve had!